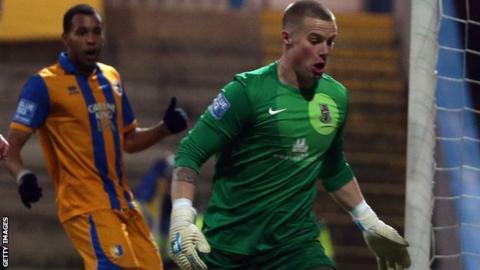 Lincoln City have been forced to recall goalkeeper Paul Farman from a loan spell with Boston for Saturday's FA Cup final qualifying round tie at Alfreton. Nick Townsend is on a season-long loan at Sincil Bank from Birmingham City. But the Championship club have withdrawn permission for Townsend, 19, to play in the competition, at least until they have a new manager in place. There is a clause in his contract with Lincoln, allowing Birmingham to recall him to St Andrew's in January. Farman, 24, has been with Lincoln since the summer of 2012, following a previous loan spell, and has made 85 appearances for the club. He joined Conference North club Boston last month in an initial three-month loan deal.